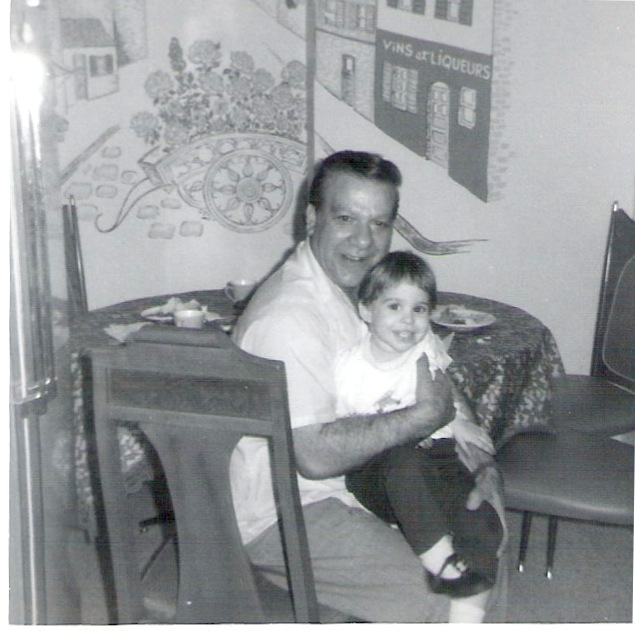 This is one of my family stories about my grandfather, Pete "Poppy" Constantino, the only grandfather I ever knew. 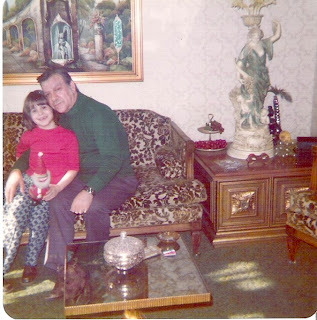 He was my mother's father, and he lived until I was 11 and 1/2 years old, passing on November 18, 1978. Both my father, Paul and his father, Joseph, had died already; my grandfather Joe before I was born; my dad by the time I was 6 years old. Poppy was the only male relative I had in my formative years that actually had a positive influence on my life. His existence, love and care made all the difference to me in that short eleven year span of my life. Unfortunately, I didn't get to spend enough time with him, not so much because he died when both he and I were young, but because my mother and he didn't get along, so she kept me from seeing him often enough. 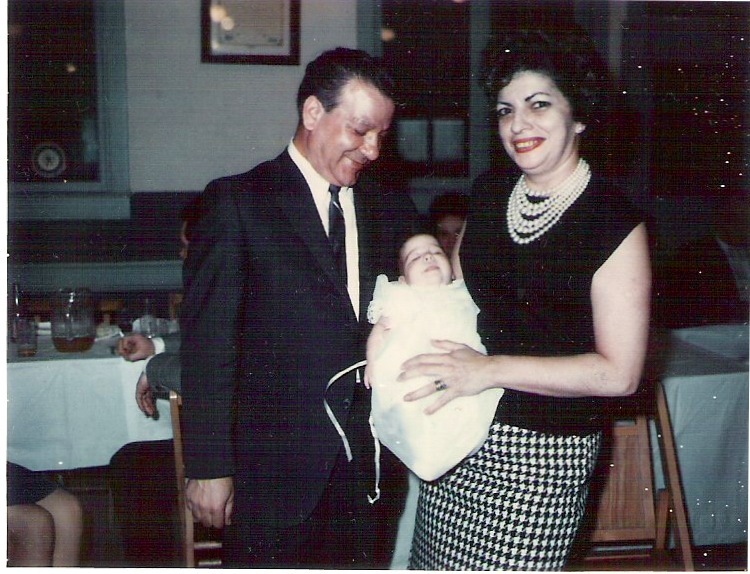 This photo is of Poppy and his second wife, Faye, my step-grandmother, at my christening. I'm guessing this was about a month after I was born, in April of 1967. I love the way my grandparents look so happy and dapper. Poppy's suit is pure 1960's "Mad-Men"esque. I bet that even though it was a dark suit, it had a sharkskin sheen to it. I'm digging on the skinny tie and narrow lapels. Faye's outfit would definitely be something I'd wear today, hounds tooth, basic black and a lot of fabulous pearls. Poppy and Faye were married in 1954 or 55. They met at a tailor's shop in a clothing manufacturing factory. Faye was a seamstress and I think Poppy was a runner or helper. The story I heard about how they met and courted is that they both took a shine to one another and Faye would bring him lunch, winning him over the proverbial way, winning his love by feeding him - peppers and egg sandwiches, chicken cutlets and eggplant parmigiana. As Faye recently told me, she was already 35, old for those days, and her father was worried that she'd end up an old maid. He had separated from my grandmother, Lucille, as she was still being called then. My mother was about 4 or 5 when they met. Depending on who's version of the story, Faye either stole Poppy from his marriage, or Poppy was saved from a horrible marriage with a she-devil. I like the later story - it feels more true to me! Poppy was a handsome, funny and debonair yet naive man. Born in South Philly, he was one of about 12 or 13 kids, from a poor Italian-immigrant family. He served in the Army during World War 2. The stories I heard about his war years were that he went to Europe and served during some fierce battles, combating frost bite, fire and liberation of camps. He got severe frost bite on his feet, which affected him during the last years of his life. His face was burned at some point during the war and he was sent to a French Hospital for recovery. Apparently the French doctor tried some experimental technique whereby he peeled the layers of skin that were burned off of Poppy's face each day, allowing new skin to regenerate and no scabs to form. Whatever this technique was, it worked. My grandfather had gorgeous skin, with no scars, blemishes or wrinkles even up to his last dying days. As for his combat battle, I remember that Faye would say that he would tell tales about helping to bring people out of the camps - carrying people who were no more alive than skeletons. The horrors he probably witnessed could mirror some of the tales in Band of Brothers. Poppy brought home his Army footlocker. As a teenager, when I discovered it, he had kept war mementos, German and Nazi propaganda, flags and arm bands; an old and unused German Diary; photos; and his medals, one of which was a Purple Heart. Faye has always said that she thinks that his injuries and war wounds were directly attributable to his health problems throughout his life. Though my grandfather suffered from Diabetes and had a heart condition, she's convinced that some of his health problems started during the war, though it could never be proven. My grandfather was a dapper dresser, up until his last days. He was buried in a suit, with his favorite polka dot tie and a pocket square. His hair was combed in his best Tony Curtis pompadour with a comb was tucked into his pocket. Poppy was never without a smile, a joke and a good story. He also was forever trying to work out some con or scam, nothing too bad or mob-like, just some low-level South Philly hijinks. Whenever anyone remembers Poppy, the first thing they say was what a great sense of humor he had, and that he was always getting taken when he was the one who was trying to do the taking! Poor Faye, she was forever taking care of him, doting on him, cooking, cleaning and in general, just loving him. I'm sure that the appeal of him when they first met was that he seemed worldly. After she realized he wasn't, I bet he won her over with his good looks and charm. She said they had a great time together, in spite of his illnesses, my crazy mother, her even crazier mother, (my maternal grandmother Lucille/Lucia) and the fact that they themselves could not have children together. They dined out well, had many friends and family and they traveled extensively. There were trips to California, Florida, Las Vegas, and to the Jersey Shore. When the casinos came to Atlantic City, Poppy's last summer was spent at Resorts Casino. He loved to gamble. I'm not sure if he was a good gambler, but I'm guessing he did okay at the tables, otherwise I don't think they would have gone back so often. Christmas, 1973. 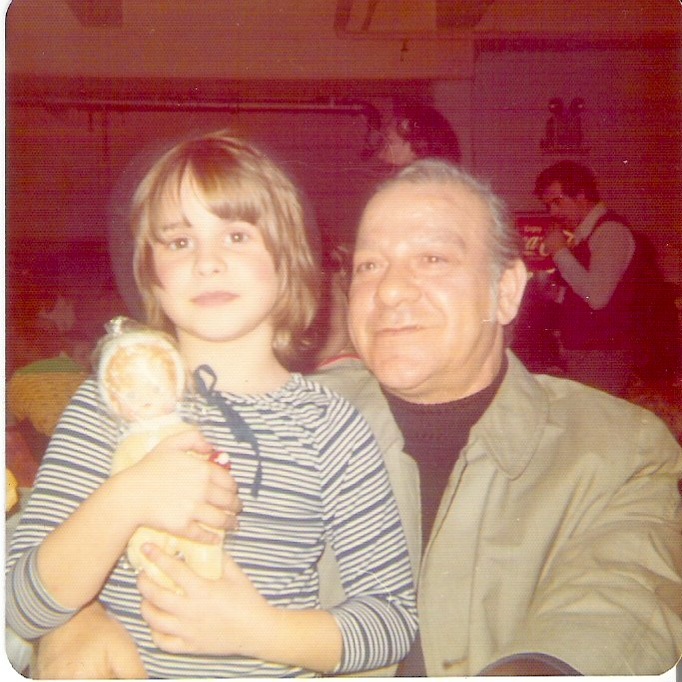 I was in Catholic School, at St. Eugene's in Aldan, PA. For the school pageant that year, we had a Christmas play where all the children in 1st grade were to play kids from different parts of the world. I was a French girl. I think we were to visit the Baby Jesus. 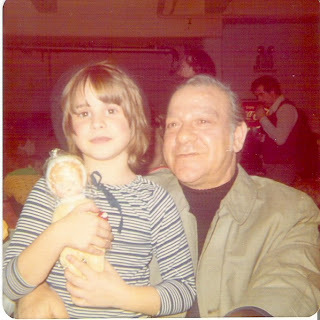 About this part I'm fuzzy, but what I do remember is that I wore Poppy's French Beret that he brought home from France. After the play was over, Santa came and brought presents to all the kids and I was given this little doll. During my three years attendance at St. Eugene's, Poppy would show up before or after school to either take me to school or bring me home. I specifically remember during the Autumn time change, that Poppy drove to my bus stop in the mornings on several occasions, to make sure I was getting to the bus stop safely since it was still dark out in the morning. 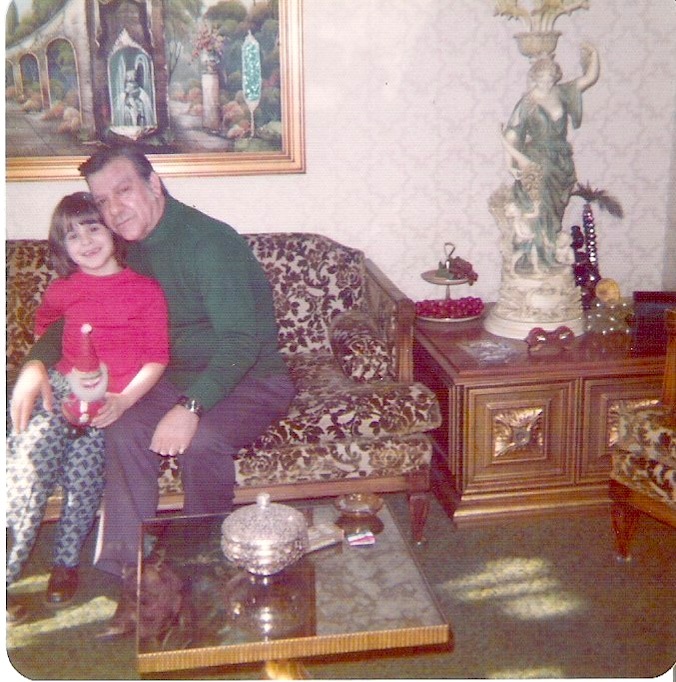 I must have been about 7 years old, fiercely independent, and I was adamant that he not show up to embarrass me. Yikes! The only family member I had who even cared that I was safe, and I was chasing him away! Ah, the idiocy of a seven-year old. I'm guessing I'm about 7 or 8 in this photo. Poppy is still chunky, he hadn't gotten that sick yet that he was thin and frail and his hair was still thick and dark. He had by this point in life, had several heart attacks. I remember finding bottles and small nitroglycerin tablets all around the house. He might not have been able to run around with me, but he could take me for a drive, take me to a store, buy me a toy and in general just be a doting grandfather. Check out this late 1960's "Parlor" furniture. I'm surprised there weren't plastic slip covers on all the chairs and couches. This set of furniture, a sofa, two side chairs, end tables, smokey mirrored coffee tables and the dancing lady with grapes lamps are classic Italian decor. The large photo in the background behind the couch had working lights that made it a three-dimensional image, with water moving and beads of oil pouring down thin filaments. High style in decor and fashions! This last photo may have been taken during Poppy's last year of life. This was the time when he and my mother were not on speaking terms at all. He didn't agree with her on how she was living her life and she didn't want his interference or judgement. Both were stubborn and both were wrong, though I think now as an adult, my mother was completely wrong. She kept me from seeing my grandparents, being spiteful to them and me and doing no one any good. At 11 years of age, I was even more independent and my own person. 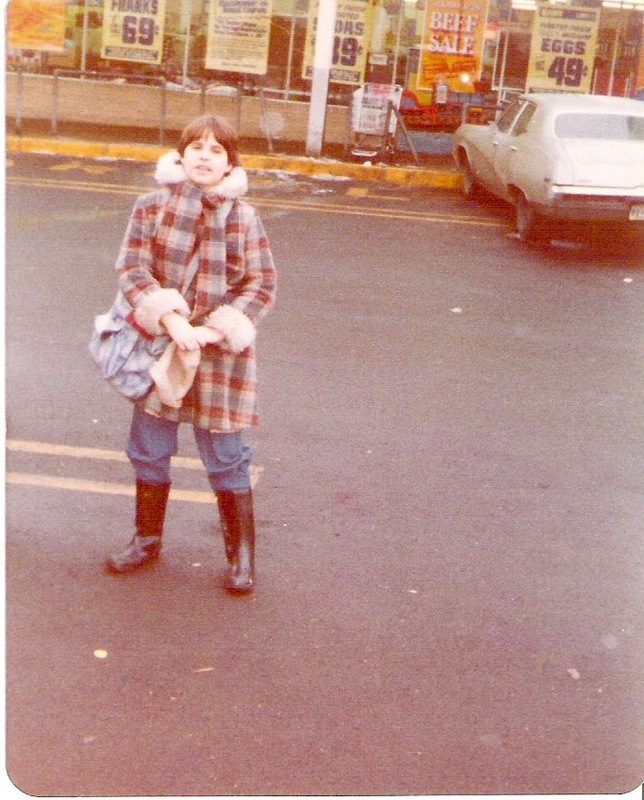 We had moved to Southwest Philly, and lived about a mile or two near my grandparent's house. In order to see Poppy and Faye, I would walk up to the Shop-n-Bag supermarket, call them from the pay phone; then they would drive over to pick me up and take me to their house. We did this several times, and it mostly worked. I got to spend some time with my grandparents and Poppy got a chance to dote on me, from at this point in his life, his hospital bed or wheel chair. During the last year of his life, he developed gangrene in his foot and leg and was confined to a wheelchair for his mobility. He could not walk far without the aid of a helper and a cane and he couldn't take the stairs to get to his bedroom. Faye took such great care of him all throughout their marriage but especially in those last years. She bathed him, tended his wounds and took care of the foot problem as best as she could. He was so sick and weak that final year but he still had his wits and his gambler's streak in him. That final summer, Faye rented a small motel room in Atlantic City, in a spot that is now the Tropicana Casino. 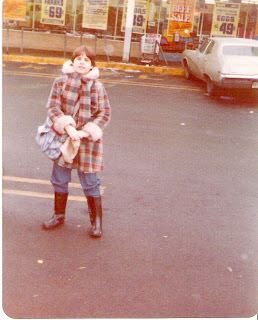 She'd drive up to Philly once every few weeks so Poppy could go to the doctor's and then back down the shore they'd go. He loved being on the boardwalk, seeing the ocean, taking in the sights and people and hitting the slots at Resorts. While my final memories of Poppy are sad, I am glad that I had this 11-going-on-40 attitude of independence. Not only did I sneak out of the house to go visit my grandparents, but I also would sneak into his hospital room to see him during his dying days. In 1978, children were not permitted to visit on certain floors in hospitals. I would go up the stair case, and sneak onto the cardiac or intensive care units. I saw my grandfather the day he had surgery to remove his bad leg, which was either days or hours before he died. My final memory is of telling him I loved him. I'm sure I was scared but I knew enough to know this was an important thing to do, and I wanted to see him. I have no regrets on my behavior, but I do regret that my mother's behavior was so selfish that she denied all of us a chance to be a family. Earlier today, on this Veteran's day, I heard bag pipes playing and saw military men and several old Veterans at a war memorial in my neighborhood. They were honoring the fallen heroes of the neighborhood. This wasn't the first time I've seen a Veteran's Day tribute, but this was the first time I actually thought about my grandfather and his war experiences, both in World War 2 and in his life. May God bless you and keep you, and thank you for having served your country and for being my Poppy. This is such a beautiful and poignant tribute to your grandfather, Denine. I, too, had a wonderful relationship with mine and I believe it helped me through some very difficult times, as your Poppy did with you. Cherish those memories. Don't give your mother another thought. YOU and POPPY made it work. That's what matters. Thanks Barbara - it's an older post, but just as timely today as when I wrote it a few years ago.